One of the most fun things for me to find in any city is the public market. The town of Napa, naturally, has a wonderful one. 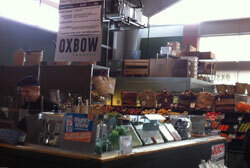 The Oxbow Public Market offers an array of goods -- from coffee to oysters to olive oil to spices. At the Oxbow Produce and Grocery, they not only offered fresh, local and organic produce that included currently-in-season persimmons and avocados and arugula but also a great recipe that brings them all together. 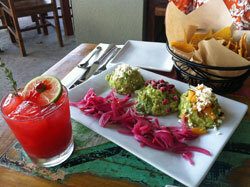 Below is their recipe for Fuju Persimmon and Avocado Salad. Enjoy! Blend lemon juice, miso, salt and pepper until smooth. With motor running, add olive oil in a slow steady stream to create emulsion. Toss gently the sliced avocados and persimmons with the miso dressing to coat evenly. If the increasing number of oranges and grapefruits given to me by friends whose trees are going nuts is any indication, we are smack dab in the middle of citrus season. As such, it seemed appropriate for me to remind you all about this wonderful recipe — first posted here four years ago — for a Winter Pantescan Salad from Tasha Zemke. Enjoy! Oranges are a real treat each winter for Sicilians. Although the fruit does grow here on the Italian island of Pantelleria, my mother-in-law always looks forward to the annual visit from a vendor who hails from the southern Sicilian town of Sciacca. He arrives here via ship and drives his enormous truck around our narrow streets, stopping for whomever flags him down, until his shipment is gone. It doesn't take long. My mother-in-law buys a good six kilos from him and then uses the oranges in a salad each Sunday when we gather for a family lunch. There is something truly amazing about these oranges -- they aren't the famous Sicilian sanguinelli (blood oranges) but are some of the sweetest, best oranges I've ever tasted. The salad, which I've come to refer to as the Pantescan Winter Salad, makes great use of good oranges; without good oranges, it is simply passable. 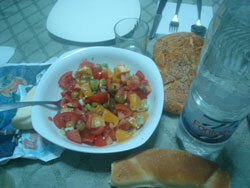 It's as bright on the table as it is low fat (the dressing consists only of salt, pepper and olive oil) and, as the cut-up tomatoes and oranges make it a bit runny, you should have some crunchy bread on hand to sop up the remaining juices at the bottom of the salad bowl. (For recipe, click "read more"). Once known primarily as a producer of pineapples, the Hawaiian Island of Lanai is again getting some attention for its agriculture offerings - this time with a much more diverse array of produce designed to go straight from "field-to-plate" at the island's restaurants. 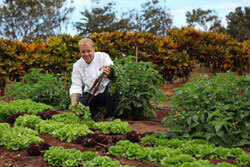 The latest addition is the new chef's garden created specifically for the Nobu Lanai restaurant at the Four Seasons Resort Lanai at Manele Bay. Appropriately named the Nobu Garden, the half-acre site is overseen by Executive Chef Sean Mell (pictured) and grows a variety of herbs and vegetables, including baby lettuce, tomatoes, squash, scallions, watermelon radish, red beets, carrots, green beans, asparagus and cilantro. Specialty produce grown specifically for the Nobu menu include daikon, Japanese eggplant, edamame, shishito peppers, cucumber flowers and sesame. Currently, more than 65 percent of the Nobu Lanai menu comes from the garden and the restaurant has identified a goal of sourcing 80 to 90 percent of its produce from the island itself. Already, all of the produce used in the restaurant's Lobster Salad with Spicy Lemon Dressing and the Bigeye Tuna Sashimi Salad with Matsuhiba dressing is island grown, with the resort itself sourcing 65 percent of its ingredients from within the state of Hawaii (including neighbor islands Maui, the Big Island and Oahu). 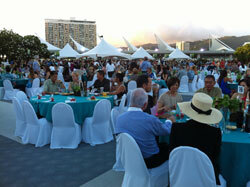 The recently completed Hawaii Food & Wine Festival attracted a stellar array of chefs (75 in all, from Hawaii, the U.S. mainland, Japan, Korea, Taiwan, Philippines and Australia) but, in a way, the real stars were the local providers of the produce, seafood, beef and poultry used in their dishes. At the two events I attended -- "Taste Our Love for the Land," held at the Hawaii Convention Center on September 7, and "Girls Got Game +1," held at the Hyatt Regency Waikiki Beach Resort & Spa on September 8 -- the work of local farmers was prominently displayed. 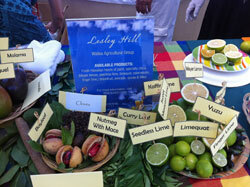 At Taste Our Love for the Land (above), each chef listed the local producers who contributed to their dishes. For instance, Taste's Mark "Gooch" Noguchi highlighted Ho Farms and Paepae o He'ela; Foodland's Keoni Chang showcased Hawaii Island Ranchers, Ka Lei Eggs and 'Nalo Farms; and Halekulani's Mark Freischmidt celebrated the work of Big Island Bees (good work, bees!). At the Girls Got Game +1 event, which featured women chefs and farmers, the farmers were there in person to show off their wares. They included Kahuku Farms' Kylie Matsuda-Lum, a 4th generation farmer who has helped open the family farm up for tours and added a cafe; Wailea Agricultural Group's Lesley Hill who, with Michael Crowell, has restored former sugar cane lands on the Big Island to produce Hawaiian heart of palm, tropical fruits and spices (left); and Naked Cow Dairy Farm & Creamery, started by sisters Monique Van der Stroom and Sabrina St. Martin four years ago and the only Hawaii producers of butter and cows-milk cheese.